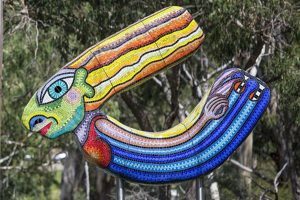 WARRANDYTE, and its surrounds, is home to many artists, and some are throwing open the doors to their studios to let the public see just how they work. The next instalment of the Nillumbik Artists Open Studios program will take place on the weekend of May 4-5, with over over 30 artists participating, including relative newcomer to the program, Deborah Halpern, sculptor and creator of Warrandyte’s own Queen of the Shire. The Diary caught up with Deborah recently, and she gave us some insight into what it’s like for an artist to welcome people in to their workspace. “Open Studios is a great time to have conversations with people,” said Deborah. Deborah says that much of what is within her studio is experimental or works in progress, and many of the works will not make it into public view. “It is quite challenging to open your studio,” said Deborah. “The good side is that you have to clean it up – tidying up is a good thing, you have to do it sometimes, but you also feel a bit invaded – it’s like people coming into your head,” she said. Deborah’s son, Artek Halpern-Laurence, is a screen printer and, with his studio on the same property, will also be participating in the program. 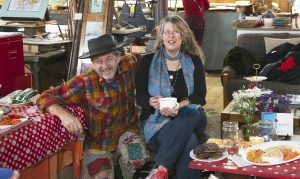 Founding Open Studio artists and Diary regulars, Ona Henderson and Syd Tunn will also be opening the doors to their Bend Of Islands studio, an ‘Aladdin’s cave … abundant with magical adventures’. The artists officially open their studios two weekends a year, in May and November, but many of the artists also run workshops at other times. The weekend after Open Studios, May 11-12, Deborah will be holding one of her two-day mosaic workshops, where participants can create a mosaic piece from design to completion. Later in the year, Research Potter, Jack Lätti will hold a workshop on wheelwork, hand building and raku firing. Navigating around the 32 participating studios across the Shire has been made easier with the program being divided into geographical zones. Studios in Zone A centre around Eltham and Research and include Kate Hudson, Chris and Mary-Lou Pittard, Wendy Hicks, Linda MacAulay, Sue McFarland, Glynis Brown, Clare Dunstan, Jacquie Hacansson and Jack Lätti. Zone B includes artists from Warrandyte, Panton Hill, St Andrews and Bend Of Islands: Artek Halpern-Laurence and Deborah Halpern, Annette Nobes, Nerina Lascelles, Bruce Mckay, Ona Henderson and Syd Tunn, Tim Read and Jess Jarvie. While Zone C features artists from Hurstbridge, Cottles Bridge and Plenty. Nillumbik Artist Open Studios will be held on May 4-5, with participating studios opening their doors from 10 am until 5pm. This amazing artwork, which was commissioned to celebrate an international blockbuster film, now takes pride of place on the Tread Sculptures art trail in the Bend of Islands. 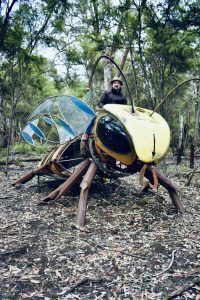 Artist Tim Read works with reclaimed steel to produce some incredible, imaginative works of art, often collaborating with fellow artists, such as glass artist Rob Hayley, who produced the glasswork for the eyes and wings on the sculpture Tim is calling Buzz. “Rob is great to work with, very experimental and always up for a challenge, which is great as I knew we would be pushing the boundaries when it came to the glasswork for this piece,” Tim said. Tread Sculptures is at 225 Catani Blvd, Bend Of Islands, Kangaroo Ground and will be open 4-5 May as part of Nillumbik Artist Open Studios, where local artists open their studios to visitors to meet the artists and get to see amazing pieces like Buzz in her natural environment.